I blogged about how happy I've been working with designer Jeremy Kratz on my recent site redesign. We've been meeting lately about small improvements and tweaks. One of the core goals was to support many screen sizes from 30" down to a small smart phone screen. You can see the results on the right in a Windows Phone and iPhone. My team is doing a lot of work on Mobile lately, not just with things like jQuery Mobile and what that means not just for ASP.NET but the mobile web in general. We've also worked with 51Degrees and they've even created a NuGet package that can help you tailor your site to any device. 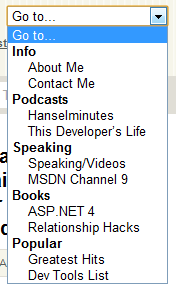 You'll hear more about Mobile in ASP.NET from Steve soon and I'll be sharing some ideas in a few upcoming conferences. When laying out a page, rather than serving up different markup on the server based on the server-detected browser, we can also use CSS3 media queries that modify a layout based on screen (viewport) size. I wanted to use these techniques for this blog. While I realize that some people want a totally custom iPhone web application when they visit a site, I draw a specific line between a Web Site, a Mobile Web Site and a Mobile Web Browser Application. When visiting what I consider a regular web site, I don't want an iOS-specific Web version and a Regular Web I can't see. What I'd like to see is the site I went to, perhaps with alternative elements or a few things moved around. However, if the site is full of interactivity, I might want a Mobile Web Site served up with different - perhaps device-specific - markup for different Smart Phones. I think the decision point for how application-like, and therefore device-specific, your mobile website should be hinges on how much your user will be interacting with it vs. just reading/consuming content. With this blog, there's not a lot that needs to be smart phone specific. I want a mobile-optimized version of the site, not a complete iOS (or Android, or WP7 or whatever) re-imagination of the site. If I did, I'd download an app. If you're creating a Web Application that focuses on "producing" (meaning pushing buttons, doing application stuff) I can see using a phone-specific framework, but when "consuming" content, I'd like my Web Site to look like a Web Site. Designer Jeremy and I (mostly him!) came up with a goal to support desktops, tablets and netbooks around 1024 pixels wide, and phones less than or around 720 pixels wide. Basically we just spin through the UL structure and create the select, options and (bonus!) option group using the existing hierarchy. becomes this, when you resize the browser really small, just by hiding the one and showing the other using the CSS above. For an important site that gets a lot of mobile traffic, you would want to use a browser database like 51Degrees that could tell you the size of the screen of a specific phone and the graphics formats (PNG, JPG, transparency or not) so you could resize large images on the server side and return mobile-optimized images. You could have a handler that detects small phones with small screens then resizes and caches images. Perhaps even grayscales them for non-color phones. This says, no matter what other CSS or the markup says, it's important that images resize to 100% but no larger. This was a nice simple solution for those larger photos that I put at the top of each post. Rather than overflowing and clipping against the edge of the phone, then resize. You can see this in action by just resizing your browser. Here you can see this site on an IPad. Note the right rail has disappeared. 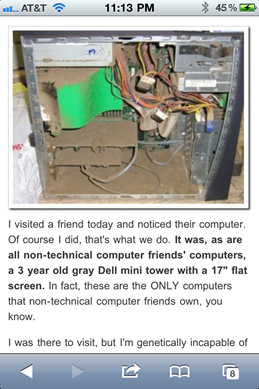 On the right, the same post on an iPhone 4 which is 640px wide. See how the image has moved up and is the width of the phone? Here's example CSS from Web Designer Wall, credited to Thomas Maier and Cloud Four respectively. You can actually test and simulator the orientations locally by making your desktop browser wider than it is tall. There's still a few things left to tweak, and these techniques only work with modern Smart Phone browsers that support these features, but for the 8% of you who are reading this blog on a mobile device it should be a better experience now. I'm interested in your thoughts! UPDATE: I'm currently reading Adaptive Web Design: Crafting Rich Experiences with Progressive Enhancement as it's amazing. Aaron gave me a review copy to check out. He outlines a similar UL to SELECT enhancement and a dozen others in a clear, clean readable manner. I'm enjoy it thoroughly. Site is excellent on iPhone. Job well done. Looks great on my Android, except for the fact that the long lines in your code samples expands the page, making the top menu about five screens wide and large images take more space than the screen (since 100% is now five times the screen width). The Android browser nicely reflows the text to fit one screen width though. string concatenation with an array as a StringBuilder is a neat trick. Might worth commenting about it though for people not familiar with the technique. + 1 on code sample width mentioned above. A wrap at about 40 chars might do the trick. Oh how it pains me to say it, but it looks awful on WP7 NoDo. Mango is close enough that going this route is the best (only) choice overall, but ding dong dang it how annoying that sites look so much better on Android and iPhone (and WebOS!). I certainly plan to use these techniques (awesome work, by the way) in my own development and impatiently await the release version of Mango. 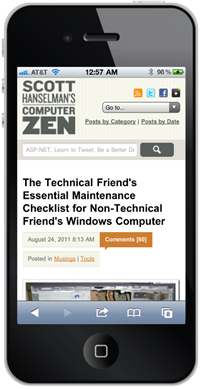 Yes, Media Query that was the thing that I mentioned you when you posted http://www.hanselman.com/blog/ABetterASPNETMVCMobileDeviceCapabilitiesViewEngine.aspx. May be you should check 320 and up of Andy Clarke http://stuffandnonsense.co.uk/projects/320andup/ it is nice boilerplate for creating different versions of your site. Maybe the next thing you should care to make the markup a bit more manageable. But overall, very cool post. I'm needing to implement these types of tricks in our new site at work too. I started using the CSS ideas found at http://csswizardry.com/inuitcss/ on one of my sites. A simple META tag in the HEAD section and then the CSS does the rest. I was absolutely stunned that a layout on my desktop flowed to a very nice layout on my Droid X. I too have been using sniffing and alternate layouts. Now I don't have to! I like what you are doing with images here and will incorporate that in as I learn more CSS3. Thanks! Nicely done. Looks good on my Blackberry Bold 9900. Even the code samples look good, though they need to be horizontally scrolled. Yeah, sadly it looks awful on WP7. The left 1/4 of the screen is the article body the right 3/4 is either the big header or blank once you scroll down to see the post. It'll look great when WP7 updates to Mango and IE9. No doubt about it on the Mango front. SERIOUSLY looking forward to the upgraded browser. As I said earlier, it wouldn't make sense to compromise going forward to look good on a browser with a shelf life of <please insert official Mango OTA update date - today's date here>. Just wishing the browser upgrade could have come sooner, or we had additional browser choices on the device. The page looks nice, but it is painful to wait until it loads on an iPhone, even on a wifi. Do you really need to show all those avatars in the comments. 150 http requests is little extreme, even on a desktop. Hm....I just loaded it on my iPhone over 3g and it was about 7 seconds. I'm surprised you're seeing it slow on WiFi? Also, the gravatars are async and cached. I'll run YSlow and see what I can do to speed things up. Looks bad on WP7. I hope when Mango comes(not sure when) it will look like what u have shown. I really like the ideas here and I'm going to try them out myself, but I'm curious about the pros and cons of this approach with regards to the size of the response you send. If you're using CSS to hide elements (like the big top nav) for mobile devices, that means you're still shipping the markup for that section across the internet to the user's device. For things like the top nav isn't it possible to just omit that section completely if you know that the user-agent or the user-agent capabilities are those of a mobile device? Vikram - It'll look good on IE9/Mango. Adam - Potentially, but we're talking about less than 1k of markup. 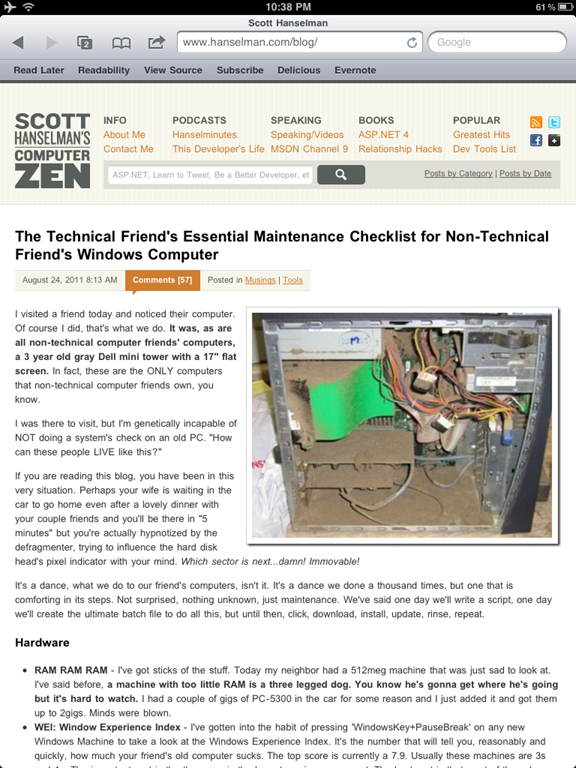 I notice the W7P shows a bit more site per screen. Scott, for pre tags, look at this post. Worked for me. Thanks for the write-up. I actually documented the UL to SELECT conversion in my book (Adaptive Web Design) too—in addition to a bunch of other progressive enhancement concepts and techniques. Update: confirming that the site works and looks great on mango beta 2! Nice job. Now I'm ready to dig into these mobile formatting tips. I come here everyday and i wanted to say that i never found an interesting blog like yours. The power of your blog is the way you share different subjects (tech, life, ...). It's really attractive. 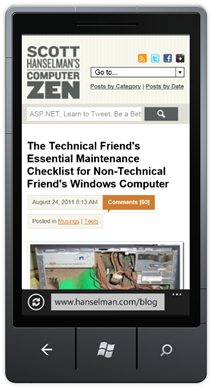 So ... Today i just want to share my feedback about your new blog layout on mobile. Few days ago, it was ok (nothing to say) but now i've a scrollbar at the bottom for each post and it's annoying. Did i say that i'm using the Samsung Galaxy S2 defaut browser ? 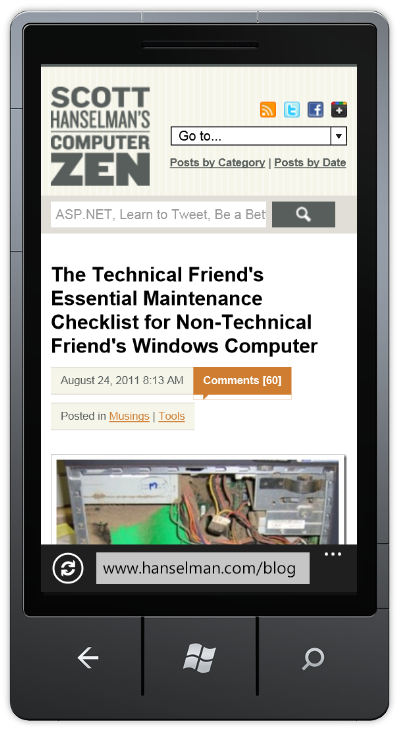 I can attest to the fact that it looks great on a Mango WP7 device. At first, not so good. Now, well done guys! Excellent use of media queries. When I first time open the site in my android phone interal browser with Android agent, it shows me a dropdown box with "Go to..." inside. but a few minutes later, maybe the page loading finished, it turn to a normal page like I got in my PC browser IE8/Chrome12. 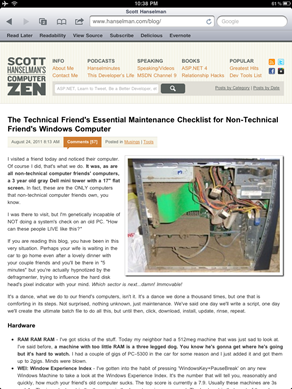 Hi Scott - great work on this site & thanks for sharing the cool technical details. How are you testing this site for different browsers & devices? first of all great work on this site and tanks for sharing your knowledge with us. This might be a kind of stupid question, but... which WP7 phone is that in the picture? You ever find a satisfying solution for your source code?